January Ends with a BANG!!! Well, what an AWESOME weekend!!! What’s upp Caribou?!?!?!?! I hope all is well as we enter the snowy month of Febraury. Caribou’s take over of the eastern seaboard was a massive success. DC and New York were no match for Caribou Nation. Down in DC, Bill and Martha and loads of Caribouinians got together at the Rockville Sports Plex. Adam Abrams, Zach Robinson, Jake Cantor (who is an absolute beast, benching 245 pounds), Ross Cantor, Jake Harburg, Mickey Bell (who didn’t really wake up until they started playing ball, of course), Ben Gold, Charlie Shapiro, Jake Blumberg, Spencer Blumberg (We hope your foot gets better), Caleb Friedman, Matt Schick, Sam Pearl-Schwartz, David Pearl-Schwartz, Jonnie Voyta, Joey Voyta, Aaron Strauss, Josh Orszag (new to the Caribou family), Aidan Martin, Liam Woo, Jake Woo, and Jake Ford (Schick and Harburg’s Friend) were all there for TEARING IT UP. Awesome group of guys. At the reunion they played a little soccer, got some pick-up basketball going, handed out Slice of Heaven T-Shirts, and enjoyed a some great subs from Subway. 5…5…5 dollar foot LOOONNNNGG. Bill and Martha had a great time, awesome to see everyone!!! A special thanks to David Pearl-Schwartz and Zach Robinson. As Bill and Martha were down in DC, Rotman was on a whirl wind tour in New York City. It all started on Friday night when he arrived in Larchmont to meet up with the Legend himself, Adam Fischer. 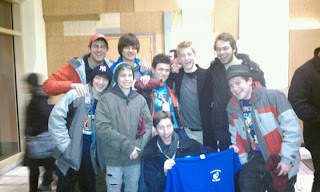 Thirty minutes after Rotman’s arrival, ghost rock material Adam Levin-Epstein, showed up for this weekends festivities. Things really began on Saturday at Friends Seminary for a camp fair, there Fischer, Levin-Ep, and Rotman absolutely tore it up and definitely let some New York Families know all about Caribou. Then three of them hopped in Rotman’s Xterra and shot up to see Max, Wendy, and Jeff Kaufman in Chappaqua. Max who is now like 6’2, had a basketball game at the Bell Middle School. The game certainly didn’t start off to hot, as the halftime score was 11-8. Though, with Wendy Kaufman and Rotman’s cheering abilities, Jeff Kaufman’s strategic coaching, and Max’s rebounding abilities, the Larchmont Tigers were able to squeak out a win, 38-36. It was awesome seeing the Kaufman’s in the short amount of time we spent together. Levin-Ep, Fischer, and Rotman were certainly on the go as they had to quickly get back down to the city for a dinner at Dave & Busters. There Sam Cox, Grant Sabean, Harry Zolot, David Barber, Sacha Heymann, Andy Godnick, Eli Fadil, and Greg Nissan were all there for an awesome Caribou Dinner. At the tail end of the dinner we had to tell the waitress that it was Levin-Ep’s birthday (though it really wasn’t), so we could get in on some ice cream action. Levin-Ep turned a little red, but embraced the fake birthday like a champ. It was great seeing our Caribou City guys, and awesome that Nissan, one of our alumnus, was able to make it. That night Fischer, Levin-Ep, and Rotman met up with some more alumni. Harry Liss, Ari Biederman, and Andrew Wallace, who are all doing real well and jacked up for the Alumni Reunion. On Sunday, the action didn’t stop as Rotman went over the Froelich’s for a little bagel breakfast. There the Schaffers (new to the Caribou family), the Kaidens, (looking into Caribou), Zabala’s (also looking to join the Caribou family), Andres Vaamonde (great surprise!!!) and of course the Froelichs all were in attendance to talk Caribou and enjoy some great New York Bagels. We wanted to thank the Froelich’s for hosting such a great get together. The weekend finished off with a bang at the Godnick’s. Though, before we had dinner, Rotman and Andy Godnick went over to the local JCC to play some hoop. Godnick has only gotten better from the last summer, as he did beat Rotman in a One on One battle 11-6. Good work Godnick, but that ain’t happenin’ again. At the Godnick’s, Lisanne and Howie put on a great dinner. Rotman got a chance to meet Ben Landau (new to the Caribou family), who is a great kid, real pumped for the upcoming summer, and seems like a perfect Caribou camper!!! We also got a chance to meet Ben’s parents Barbara and Shawn and their daughter Annabelle (Matoaka camper), great family and real excited to see them again on visiting day!! Also at the Godnick’s were the Lublins, Dylan and Michelle. Jake was at a hockey game, but it’s always AWESOME seeing Michelle and Dylan. Dylan was telling Rotman all about Chase Gornbeins Bar Mitzvah and how ridiculous the scene was. But, overall, the dinner was great, tons of food, lots of fun, and we even went out for ice cream!!! What an amazing weekend. It was great seeing everyone!!! Rotman is back down in New York February 12th-13th, so hopefully he can see even more Caribou guys. Keep in touch. ROCK ON!!! !